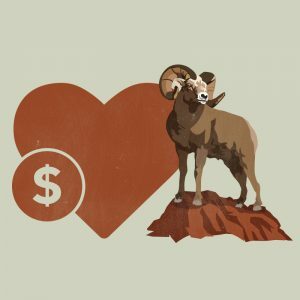 Your donation or membership can help the National Bighorn Sheep Interpretive Association and bighorn sheep in many ways. It will assist in keeping the Center open throughout the year and help to fulfill our mission of educating people about bighorn sheep and the conservation of wildlife and wild lands. Operational needs include not only paying for utilities, staffing, office supplies, and special events but also maps for visitors, exhibit maintenance and traveling education trunks. Your donation may also be targeted for specific projects such as exhibit upgrades, underwriting annual auction and fundraiser dinner expenses, or assisting with bighorn sheep research or habitat improvements. The National Bighorn Sheep Interpretive Association is a non-profit 501(c)(3) organization that operates the National Bighorn Sheep Center. IRS Tax ID #83-0301605. 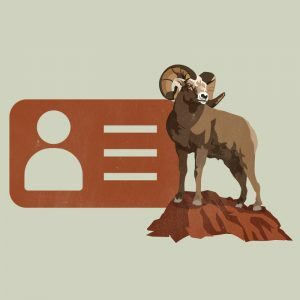 In addition to helping us spread the word about the value of bighorn sheep and other wildlife, a membership at any level entitles the card-holder to FREE admission and a 10% discount off most merchandise in our giftshop. Individual: 2 VIP Passes for Your Guests. Family: 4 VIP Passes for Your Guests. Business: 6 “Big 4” Raffle Tickets for the Bighorn Bash Annual Fundraiser. Partner: 12 “Big 4” Raffle Tickets for the Bighorn Bash Annual Fundraiser. Patron’s Circle: 2 Dinner Tickets for the Bighorn Bash Annual Fundraiser. Summit Club: Free Guided Wildlife Viewing Tour for 2 Members and up to 4 Guests. Benefactor: Free Guided Wildlife Viewing Tour for 2 Members and up to 4 Guests, with Catered Lunch, Plus 2 Dinner Tickets for the Bighorn Bash Annual Fundraiser. To Become a Member, input the gift amount that matches the membership level above. Providing educational outreach for partner groups as specified in the NBSIA Education Plan plus mutually agreed upon opportunities for NBSIA outreach. 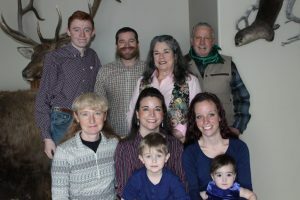 Gary Butler and his family have long supported wildlife in Wyoming, whether through Gary’s 40-year career with the Wyoming Game and Fish Department, contributing energy, sweat and financial support towards wildlife conservation or by instilling an appreciation for wildlife and wild country in young people. Gary has been honored not only through the Ron Ball Award and his induction into the Wyoming Outdoor Hall of Fame, but his passion and commitment to wildlife lives on in the legacy of conservation funds dedicated to supporting wildlife for the long-term. The establishment of the NBSIA Conservation Education Fund will focus on education and engagement through NBSIA’s education programs and partnerships. To establish the NBSIA Conservation Education Fund, the Butler Family Foundation contributed $25,000. NBSIA has agreed to build the principal to $250,000 or more within the next ten years. Your donation will be used to grow the principal and only the interest earned will be used to finance NBSIA’s educational efforts far into the future. We are honored Gary chose NBSIA and are excited for this fund to support education and outreach long into the future. We sincerely hope the Butler Family’s gift inspires others to contribute to this important fund. How YOU can help support the NBSIA Conservation Education Fund: Help us reach our fundraising goal! Help us reach the $250,000 goal! Your one-time or sustained tax-deductible contribution to the NBSIA Conservation Education Fund will support educational projects and programs by NBSIA. Your donation to the Fund will be recognized on NBSIA’s website, through annual reports, or you may remain anonymous if you desire. Donate through our website, through the “donation” button above, with a note that your donation is designated to the “NBSIA Conservation Education Fund”. Thank you! The National Bighorn Sheep Center Volunteers provide key support to our daily operations. Your help is needed to allow us to grow and provide services and programs to both human and bighorn populations. Our goal in developing our volunteer program is to provide rewarding learning opportunities and experiences that advance bighorn conservation through education, hands-on stewardship projects and special events and programs. Center staff support volunteers with training and guidance for all volunteer opportunities, whether they are one-time stewardship projects or a long-term investment of skills and talents. We welcome volunteers in all capacities, so whatever your skills and schedule, there’s a place for you on the National Bighorn Sheep Center team! There are many different ways to support the National Bighorn Sheep Center. You can volunteer, donate money, or donate items to support our work. If you would like to help us purchase any of these items through a donation click here. You! Visit our volunteer page to find out more!